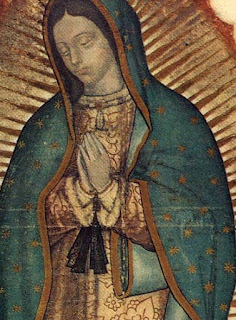 The story of the appearance of Our Lady of Guadalupe is remarkable in many ways. An important part of that story, that of the image that was given to St Juan Diego Cuauhtlatoatzin, is itself enigmatic. What follows is personal speculation - I am describing what strikes me as so mysterious when I look at this image. As a revealed image, it is a rare Western example of a small category of sacred art called in Greek acheiropoieta - not made by human hands. In this example, we have some details clearly derived from Aztec culture and some from traditional Christian culture, including some features not normally associated with the Spanish Christian culture of the day. Something else that is striking about this image is how these aspects are combined so as to create something that has great power to convince one of the truth of what it conveys. 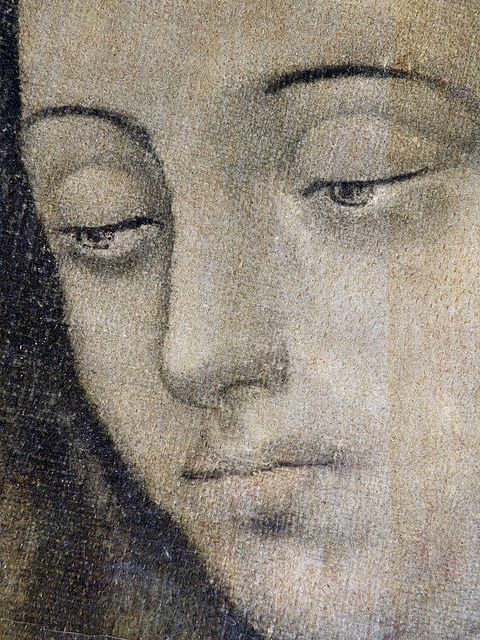 This apparition caused millions to convert, and a large part of that was due to the persuasive influence of the visual vocabulary employed by the “artist” of this image. It spoke simultaneously to both the Aztecs and the occupying Spaniards, and continues to draw devotion today from Christians from all over the world. The subject of this sacred image came up recently in a lively podcast in which I was in conversation with Christopher West (of the Cor Project and the Theology of the Body Institute). We were discussing the broader subject of the place of contemporary popular culture in a Christian culture and whether or not it has a place for Christians as a tool for evangelization. In the course of this, we touched on subjects ranging from 1970s rock music (British, Irish and American) to Gregorian chant. (You can listen to the podcast here, or watch it on YouTube, here). In the course of this exploration, we spoke of how the liturgy is the wellspring of Christian culture, and it is the culture of faith, connected to the liturgy, that is the strongest contributor to the universal human aspects of culture. In addition, this can be integrated discerningly with the contemporary culture so that it also reflects a particular time and place. If this integration is done well, the effect of the combination is to powerfully connect the universal truths to contemporary society; if, on the other hand, it is handled clumsily, it will have the opposite effect, and will lead people away from salvation. 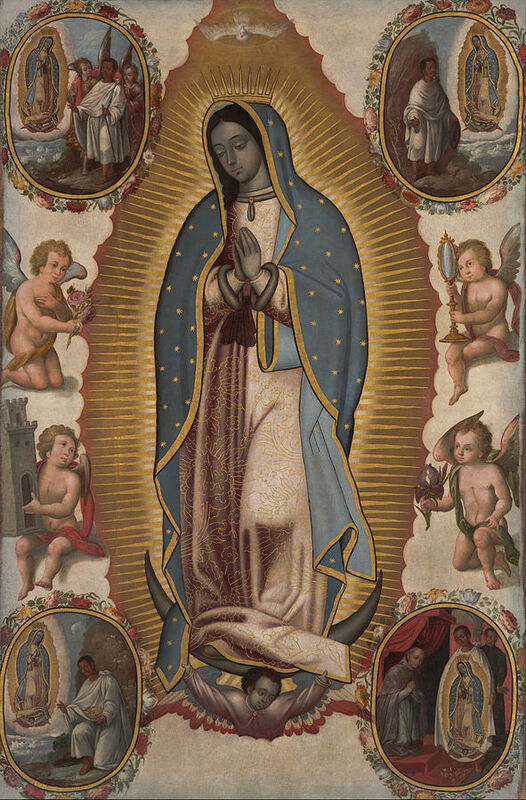 Our Lady’s hairstyle, parted in center, was in 16th-century Aztec culture the sign of a maiden, a virgin, but the ribbon and bow around her waist signified that she was pregnant. This is therefore a young woman who is portrayed simultaneously a virgin and pregnant. The quatrefoil roses articulated in sepia lines on the pale brown-ochre shawl signify royalty in the visual vocabulary of Aztec culture. But this image spoke to the Aztecs of more than their own culture, because it has elements that come from traditional Christian culture as well. These are universal in that they speak to all Christians (one might make an argument in some cases for non-Christians too). It is these that speak to 16th-century Spaniards and to many Christians from all over the world since. We can see, for example, the blue shawl, a common color for Mary’s outer robe. It is said to denote royalty. and Marian chapels often have their walls painted in this color. The exact shade of blue is unusual in that it is not lapis lazuli blue (French ultramarine), which a contemporary painter of the High Renaissance period might have used, but rather a turquoise blue often described as cerulean. I have no explanation for this difference. Also, I am curious to know more about the pigment that provides this color than Wikipedia can tell me. Cerulean blue pigment is only known since the late 18th century, when it was chemically created; it is not from a naturally occurring mineral. It might be that there is no great mystery here and that it is an effect created by a simple combination of other, naturally occurring green and blue pigments available at the time. The eight-pointed stars represent her connection with the “eighth day” of Creation, her Son, Jesus Christ, who rose on the eighth day of the week. Traditionally in Eastern icons, there will be just three stars, symbolizing the perpetual virginity of the Theotokos - God-bearer - before, during and after her pregnancy. There are many more than three stars here. Perhaps it was deemed unnecessary by the Divine Artist to stay with three stars because her virginity is indicated in a different way, as already mentioned. There is also the moon, which is consistent with Scripture in that it shows Our Lady as the woman of the Apocalypse (12, 1), with the upturned crescent moon. Another feature which interests me greatly is the nimbus of light around her. The account of the woman in the Book of the Apocalypse describes her as being “clothed in the sun.” The golden nimbus around her whole person might correspond to this. However, this is more complicated, there is something else going on here I believe that relates to the symbolism of the mandorla. A mandorla is an iconographic symbol in the shape of a circle or an almond-shaped oval signifying heaven, divine glory, or light; mandorla is Italian for “almond.” It is an indication of the divine light of sanctity, but the mandorla of this type is generally reserved for Christ, at least in traditional iconography. I suggest that it is included here to indicate the presence of Christ within her womb. It is not there so much for the God-bearer, but for God! 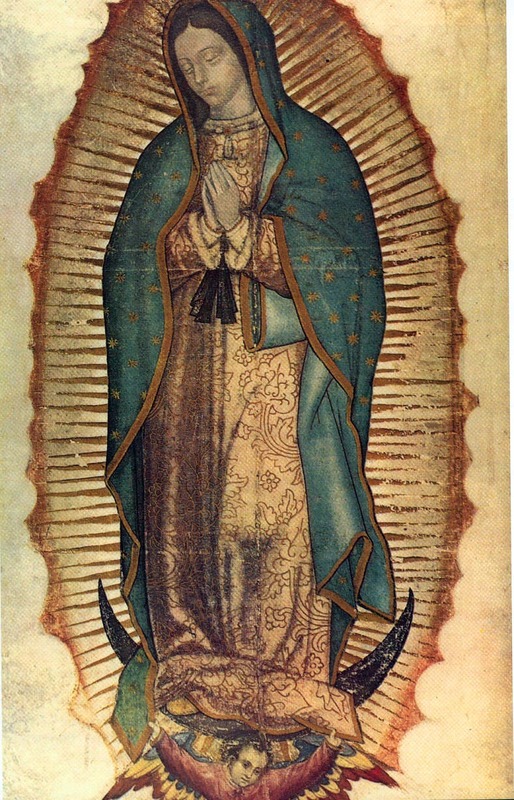 This is the Christian way of indicating that Our Lady is with child, the divine child, which complements the symbolism of Aztec culture. Remember that if this image had not spoken to the Spanish occupiers too, no one would have taken Juan Diego seriously. Furthermore, take a close look at the gold envelope that surrounds her. This is not, as one might first suspect, a series of bright gold darts emanating from Our Lady. Rather it is a series of dark darts emanating from her on a gold background, the outer limits of which describe the mandorla shape, which is a smooth almond. In other words, this mandorla is getting darker the closer it is to her. Why should this be? 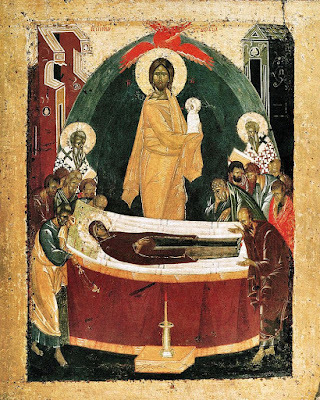 You can see an iconographic mandorla here in an icon of the Dormition painted, by Theophan the Greek in 1392. In the following icon, the sense of a mandorla getting darker as it moves towards the center is done in a different way. As we can see above, the hidden “heart of darkness” is suggested visually by darts of darkness that come from a point obscured by the figure of Christ. This is similar, but not identical, to the device used by the artist in the image of Our Lady of Guadalupe. Notice also, incidentally, that while the Apostles are able to perceive the glorified Christ, they still do so dimly. They are partially and temporarily deified, but not fully, and so are partially blinded by the Light and knocked off their feet. To indicate this we see the rays that strike them as shafts of darkness, and the Apostles themselves will not receive halos until Pentecost, in contrast with the Prophets who are already in heaven, flanking Our Lord. It is interesting to note that virtually every copy of the Our Lady of Guadalupe icon gets this detail wrong and inverts the direction of the lines. For example, here is one painted around 1700. Going back to the original, while the cherub does partially evoke in some ways those of Raphael in the art of High Renaissance Italy, it is not quite so sentimental as his, I would say, and the angel’s wings are not of the fluffy white variety, but layered green blue, white and red, which again is common to both traditional iconography and Gothic art. The Annuncication, by Jacopo Torriti; mosaic in the basilica of Santa Maria Maggiore in Rome, 1296. All of the constituent parts (including aspects not described here), both those particular to a specific time and place and those that are universal, combined to create a powerful force for persuasion. This being so, if we imagine for the moment that the artist is not divine, then we have indeed a remarkable mortal artist, one who is simultaneously aware of Scripture, Christian artistic tradition going beyond 16th-century Spain, and Aztec culture. I suggest that someone of this profile would have been hard to find in Mexico in 1530! To complicate matters further, there are the facts that have come to light as a consequence of scientific research on the image, things that could not have been known at the time. For example, there is an reflection in Our Lad’s eye of a room of people, which corresponds to what is known about the people present when Juan Diego later presented the image to his bishop. This reflection, however, cannot be seen with the naked eye. I’m not sure how the hypothesis could make the transition into a theorem, which is what is necessary to constitute genuine scientific proof. Let suppose, for argument’s sake, that the hypothesis is correct; I suggest that was built into the image in order to convince skeptical 20th-century scientists and atheist materialists, but not 16th-century Spaniards or Aztecs. You can make your own mind up on this one, here. For what it’s worth, I am skeptical about this one - I don't know how many computer algorithms it took to get the interpretation they were looking for. In accordance with the iconographic tradition, there is no strong cast shadow; the image is predominantly defined by line, rather than tone. This is all the more remarkable, since this it was made is the period of the High Renaissance in Italy, which bears very little comparison to this stylistically. Spain did not take to this new style instantly, and art of the period might have been more akin to northern Flemish art from the Spanish Netherlands, and so stylistically closer to what we see here; nevertheless, I do not know of any other artist of the periods whose style is like this. It almost seems to be a new and unique style of iconography. Again, if this was not a revealed image, then our artist, aaprt from everything else already mentioned, is also a theologian of insight. He understood that the best artistic tradition to represent his subject should be iconographic, and then had sufficient familiarity with it to apply the principles of that tradition so as to create legitimate modifications of style that would make it more accessible to the local population, both Spanish and Aztec. 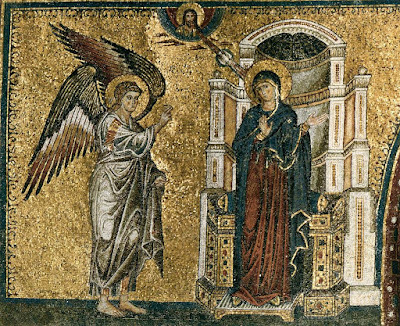 In regards to the representation of the mandorla, he was seemingly more familiar with the iconographic prototype than many of his contemporaries, (judging from the flawed copies made of it by other artists). This grasp of the underlying principles was so well understood that he was able to represent the nimbus getting darker in a unique way, without straying beyond the bounds of the tradition. If on the other hand, this is an authentic icon “not made by human hands”, and painted, so to speak, by the hand of God, then the remarkable degree of conformity to tradition tells how authentic and true that tradition is. The iconographic tradition was developed by faithful Christians in the first centuries of the Church in order to communicate by visual means the truths of the eschaton. We must conclude that they were divinely inspired in their thinking to be so in conformity with this and all other acheiropoieta.